Out Doctors are all Fear Free certified. Welcome to Pet Calls. Your pet’s health and well being is our top priority. We are committed to providing high quality and gentle veterinary care. At Pet Calls we hold ourselves to the highest standards in experienced, professional care for the prevention, diagnosis and treatment of disease and injury. We are proud to be a AAHA accredited practice with regular evaluations by trained AAHA professionals. We believe that the human-pet bond is amazingly special and are here to keep your pet family members as healthy and happy as possible. We have a number of resources for you to learn about how to take better care of your pets. Browse around and look at our articles and pet videos. The best veterinary care for animals is ongoing nutrition and problem prevention. If you want to ask a question call 561-434-2097 or email us and we'll promptly get back to you. 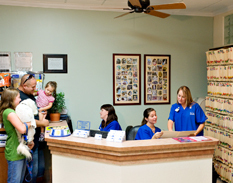 Our Lake Worth veterinarian office is very easy to get to, and you can find directions on our Contact Us page. You can also subscribe to our newsletter which is created especially for Lake Worth pet owners. In between your veterinary visits, your pet will benefit from you reading these free informative articles. At Pet Calls Animal Hospital, we treat your pets like the valued family members they are. Please call our office and see how this therapy can work for your pet! New patients receive $10 OFF first visit. Sign up using the form or call us at 561-434-2097. Dr. Ehrlich graduated from the University of Florida College of Veterinary Medicine in 1989. After graduation she worked for two veterinary hospitals and then in 1992 started Pet Calls as a veterinary housecall practice. Dr. Roberts graduated from the University of Florida College of Veterinary Medicine in 2001. Following graduation, he completed an internship in small animal medicine and surgery at Florida Veterinary Specialists. Dr. Mayer-Roenne grew up in Austria and Hungary. She attended the University of Veterinary Medicine in Vienna, Austria and graduated in 2002. She completed a rotating small animal internship at Cornell University, Ithaca, NY. In 2004 she returned to Europe and was a staff veterinarian at the Small Animal Internal Medicine Clinic at the University of Veterinary Medicine, Munich, Germany. Dr. Tepper graduated from Mississippi State University College of Veterinary Medicine in 2005. She completed a rotating internship at Red Bank Veterrinary Hospital and then a neurology internship at Mississippi State. After her interships , Dr. Tepper worked at two veterinary hospitals, moved to Florida and joined Pet Calls team this August. She enjoys general practice and when not at work, appreciates the time she spends with her family. "I have been a client of Pet Calls for 21 years. For all of these years, the doctors and staff have always gone above and beyond with the care they provide/provided for my pets and my fosters. They show, repeatedly, that they truly care about their patients and their patient's parents."